Rameswaram a town in Ramanathapuram district of Tamil Nadu. It is located on Pamban Island separated from mainland India by the Pamban channel and is about 50 kilometres from Mannar Island, Sri Lanka. Pamban Island, also known as Rameswaram Island, is connected to mainland India by the Pamban Bridge. Rameswaram is the terminus of the railway line from Chennai and Madurai. Together with Kashi, it is considered to be one of the holiest places in India to Hindus, and part of the Char Dham pilgrimages. Hence, it is a bustling pilgrim centre. It is situated in the Gulf of Mannar at the very tip of the Indian peninsula. According to legend, this is the place from where Lord Rama built a bridge Ram Setu (also known as Adam's Bridge) across the sea to Lanka to rescue his consort Sita from her abductor Ravana. Both the Vaishnavites and Shaivites visit this pilgrimage centre which is known as the Varanasi of the south. 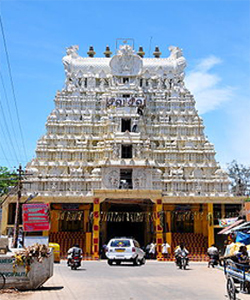 Sri Ramanathaswamy temple is situated close to the sea on the eastern side of the island, which is in the shape of a conch. 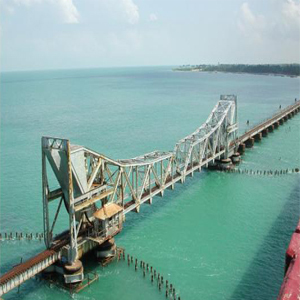 The island is connected with the main land at Mandapam by an awe-inspiring rail bridge and a road bridge. In ancient days, the shrine was only a thatched hut. Over the centuries, the small shrine was gradually developed into what it stands today as a massive and magnificent structure.